Four Leading Strategies to Identify, Attract, Engage, and Enroll the Right Students. Students today are dramatically different from students ten years ago. They’re not attending college just for a degree and “the college experience;” they want assurance of a job at the end of it all. And in addition to their heightened concern for finances, schedule flexibility, degree options, and a rewarding career, they want personalized answers—immediately. In short, they’re tough customers for marketing and enrollment departments to serve. 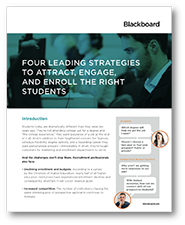 Blackboard can help you navigate the marketing and enrollment needs of today’s students. © 2018 Blackboard Inc. All Rights Reserved.